Custom windows are a great way to add detail and style to your home or to give it that added protection from whatever climate your home is located in. At Henley Supply Millwork, we take pride in the many options we have available for our custom windows. Whatever you are looking for, we’ve got it. We work with some of the top names in the business on each of our custom windows to bring you only the best. Find out more about the types of custom windows we supply in the information below. MGM has a unique full 4 9/16″ frame unit at value pricing. Another feature of their products is factory painted vinyl with two tone options in many colors. Moss has a very competitive priced product line that includes a new Clay color. SilverLine by Andersen product line features a wide exterior trim, and a Lifetime Warranty. Jeld-Wen offers a full vinyl product line that compliments their Wood Clad windows. For our clad windows, we use suppliers Jeld-Wen and Anderson. Both of these manufacturers create top of the line wood clad windows. Anderson wood clad windows are available in 50 colors and many different sizes and variations, you are sure to find something that you like. With so many options, you can be sure that your windows will stand out from the rest, and you realize you don’t have to stick to the standard, cookie-cutter windows. Jeld-Wen also offers a warranty on their wood clad windows as a result of using AuraLast wood in all of their products. At Henley Supply Millwork, we also offer options for specialty windows for our clients. Specialty windows can be decorative in nature, such as different shapes and sizes, or placed in locations throughout the home that might not otherwise have a window, such as a skylight for your bathroom. We will work with you to create and fit your home with a one of kind, unique special window. Let’s face it, life happens and windows need replacing from time to time. At Henley Supply Millwork, our replacement windows are installed by licensed and insured professionals that will get the job done right. Whether your replacement need is a result of a cracked window from debris, storm damage, or that you simply want to upgrade to higher quality windows, our team has you covered. Let us install the highest quality windows for your home. Henley Supply Millwork offers just about any type of exterior door you can imagine. Our team of professionals can help you find out what type of door you are looking for and come up with a solution that looks nice and is within your budget and style. Our doors are all manufactured by Anderson, DSA Master Crafted Doors, Endura, Jeld-Wen, DDL, Simpson Door Company, Woodgrain Doors, and True Tech Doors so you know you are getting the highest quality exterior doors you can find. We offer exterior doors that are made from just about any material you might want or need, including mahogany, wood, steel, iron, leaded glass, or fiberglass. And to add to all of that, our doors come with a lifetime warranty that is included alongside our Endura Force Five frame system. With manufacturers like Simpson Door Company, Woodgrain Doors, Jeld-Wen, and Steves, our interior doors are second to none. Interior doors come in stylish options with all of these manufacturers, with a selection of styles that will allow you to create a one of a kind look. Our interior doors come in either molded or wood and are a variety of sizes, widths, heights, designs, frames, and embellishments. No matter your style, we have it covered, from traditional to modern, to unique, we have it all! Add to that the fact that our interior doors are installed by our licensed and insured professionals who hand assemble and hang the doors with ease. Our doors are made to order and placed in your home by the best of the best. Mouldings can enhance any home with a unique style and beauty. Moulding is a great way to show off your style and make your home one of a kind. At Henley Supply Millwork, we keep a variety of mouldings in stock for our customers’ needs. We carry finger-jointed pine, poplar, solid pine, and MDF moulding that is housed in a 55,000 square-foot warehouse. Moulding is one of our most popular items because of it’s unique uses throughout many areas of the home. 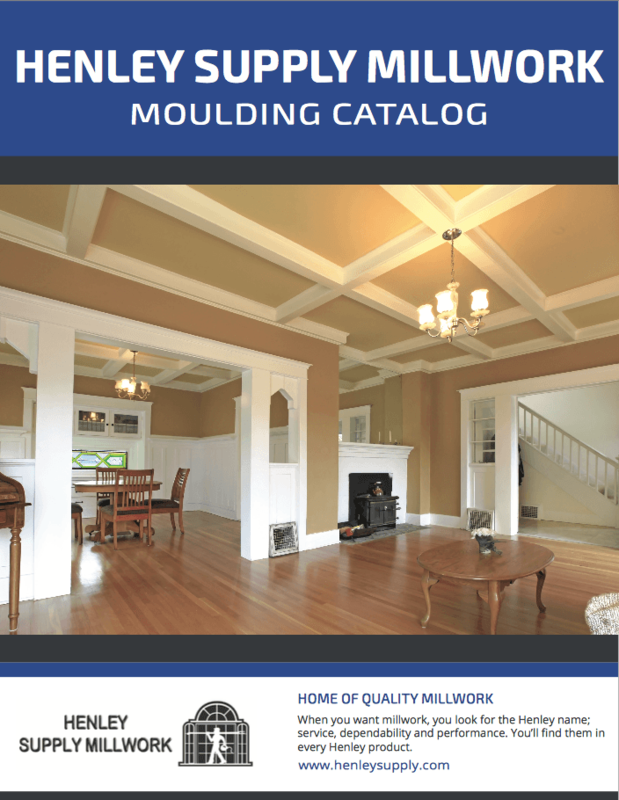 We have over 150 profiles of mouldings that are readily available for quick and easy shipment and can even be made custom to order. We use only the best manufacturers for our mouldings with BlueLinx and East Coast Mouldings, so you know you are getting quality when you choose us for your moulding needs. With so many different designs and applications in new home construction, we offer a wide variety of stair parts and speciality stair systems. If you’re looking for the traditional look of wood, we have that. If it’s the contemporary look of iron, there is a wide variety of that as well. Be original, mix it up and create your own look. Please visit our suppliers to see and design your next project. We offer several premium and cost effective column options. Fiberglass being the most popular choice, is load bearing, weather and insect proof, and requires minimal maintenance. With square, round, and craftsman styles available in many different sizes, columns can help beautify your home.